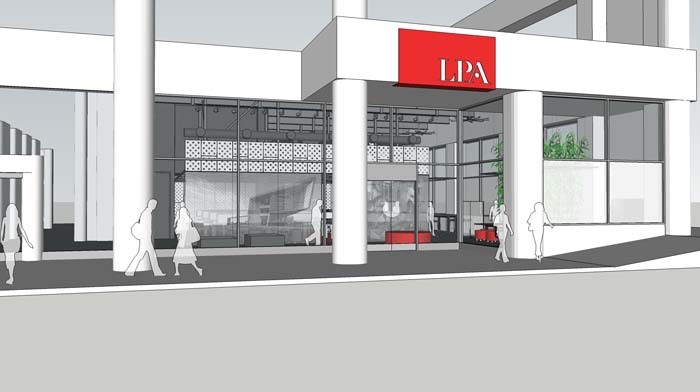 Expanding to its fourth office in California, LPA Inc. has designed a highly sustainable adaptive re-use space to house its new San Jose office and better serve an existing client base in the hi-tech capital of the world. LPA's San Jose office will be a working lab where sustainable technologies and products can be tested with ease. We talk to our clients all the time about sustainability and about being aware of their environmental footprint, so what better way to prove that than in our own space. To better serve current clients in Silicon Valley, the integrated sustainable architecture firm, LPA Inc., is officially opening an office in San Jose, Calif.
Not only will the firm add San Jose to its roster of California locations – including its Irvine headquarters, Roseville and San Diego – but the new office was designed as an energy-efficient, eco-friendly space and will showcase the firm’s sustainable design process and integrated design. In converting a bank office, originally built in 1986, LPA designers got rid of the dated perimeter offices and internal cubicles, preserved the existing back of the house rooms and opened the space up into a 21st century, collaborative workplace targeting LEED-CI Gold certification and American Institute of Architect’s 2030 Challenge. Featuring 21-foot-high ceilings and 16-foot-high windows, all employees are given ample access to natural light and views. 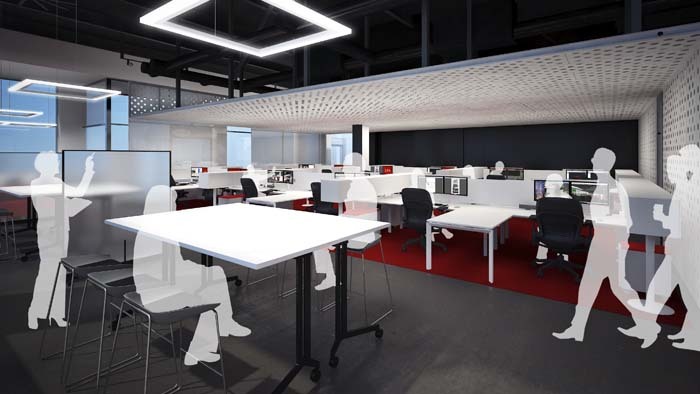 Divided into two areas, a work zone and a collaborative zone, the latter incorporates moveable furniture so that the space can be quickly and easily re-configured, as needed. Meanwhile, the work zone is defined by a unique “ventilated fold” made up of white perforated metal panels. Serving yet another purpose, the ventilated fold holds two glass panels which project images of current and past LPA projects onto the downtown street. To more efficiently heat and cool the space, LPA’s in-house engineers developed a strategy that uses variable-speed water source heat pumps, exceeding Title 24 requirements by around 40 percent. The innovative design also minimizes ductwork with the use of four energy efficient circulating fans. “With increased air movement, via energy-efficient fans and not having to rely on the compressor, we can cool and heat the space less with the same level of comfort,” explains McClintock. The team intentionally left the M/E systems exposed to enable simplified plug and play of new products and systems. Similar to LPA’s other offices, the firm actively utilizes its own work space as a “living laboratory” to Beta test new technologies. While taking a client into a show room is one way to relate the benefits of a newer building system, showcasing the latest technology within one’s own office space is qualitatively better, says McClintock. As for lighting, energy efficient LEDs make up 90 percent of the fixtures, general illumination has been minimized and strategically designed task lighting puts light where it’s needed. Consequently, the office has a lighting power density of .37 watts per square foot, as compared to an average office space of 1.10 watts per square foot. 50 percent water reduction with low-flow fixtures. The original concrete floor and exposed structural frame are exposed and used as a finish material following LPA’s “do more with less” approach. Building materials made from 20% recycled content and furniture produced with 70% recycled content. 75% of recycled construction waste. Bike storage, changing rooms and easy access to public transportation. 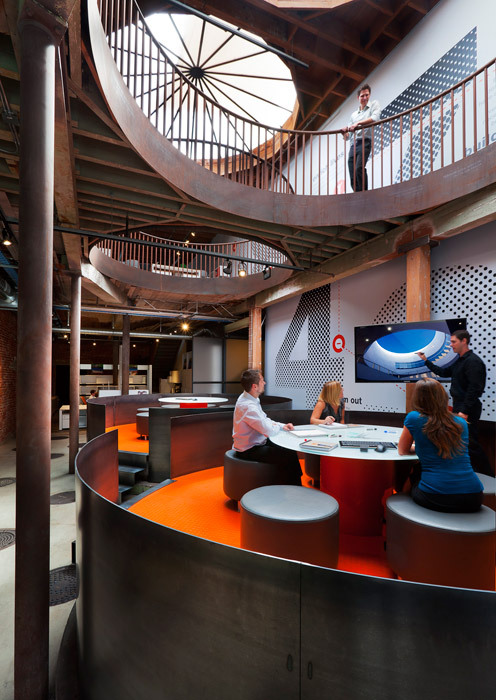 Not only did LPA reinvigorate the office by repurposing it into a 21st century collaborative workplace, but this San Jose venue is expected to play a role in revitalizing the downtown core as well. Of course, the overriding goal will be LPA’s ability to more comprehensively service its clientele which includes more than 50 corporate, hi-tech, education and life science companies and institutions in the area. The new downtown San Jose office at 60 S. Market Street officially opens on Dec. 2, with an open house scheduled for Jan. 30, 2014. Founded in 1965, LPA has more than 220 employees with offices in Irvine, Roseville, and San Diego, Calif. The firm provides services in architecture, planning, engineering, interior design, landscape architecture, signage and graphics, and of their professionals, more than 78% are LEED accredited. With extensive experience in public and private architecture, LPA designs a diversity of facilities that span from K-12 schools, colleges and universities, to corporate and civic establishments. In 2010, the firm was recognized internationally as one of the Top Five Green Educational Design Firms in the U.S.